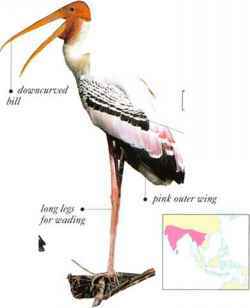 Recognized by pink tints on the wings and back and a finely checkered panel on the inner wing, this stork occurs on freshwater lakes, marshes, and paddy fields. Its feeding method is specially adapted for very muddy waters. When wading, the stork swings its partly opened bill from side to side underwater, snapping it shut if it touches a fish. Frogs and other small creatures are also caught in this way. The Painted Stork feeds by day, often in groups at a good food source, and roosts in larger flocks at night. It nests in colonies, normally in trees that stand in or close to water. Nests are packed together at close quarters, and the site is frequently shared with other stork species as well as egrets, ibises, and cormorants. 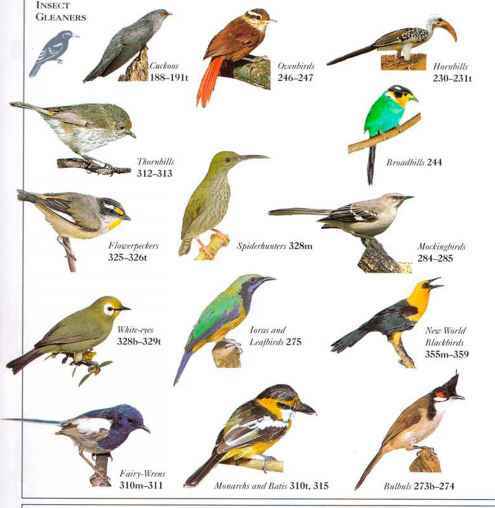 • NEST A large platform built of sticks, with a shallow hollow at the center, situated in a tree.